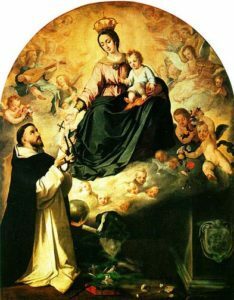 Of the popular devotions beloved of Catholics, the rosary best illustrates the inventive genius of medieval èiety in the West and presents a balanced fullness known to no other pratice of private devotion. Surely that is why saints and mystics, bishops and popes, popular preachers and theologians – and in a special way Mary herself – have expressed delight in this form of prayer and have promoted it so widely. The origins of the rosary lie in the Marian piety of the Cristian Middle Ages. In private devotion the whole Psalter of 150 psalms was divided into three groups of fifty psalms each. In imitation of this way of praying the psalms, there grew up a variety of popular devotions made up of 50 or 150 Our Fathers or Hail Marys that were often counted on knotted strings or beads. These were psalters of praise in honor of Jesus or Mary, and a psalter of Mary was often called a “rosary” (a gift of roses), a chaplet, a wreath, or a bouquet. Around 1365 a devout Carthusian monk arranged 150 Hail Marys into groups of ten (decades) and put an Our Father between each decade. Around 1409, another Carthusian, Dominic of Prussia, composed a pamphlet that attached fifty thoughts about the lives of Jesus and Mary to a rosary of fifty Hail Marys. Soon this form of rosary was also divided into decades, with an Our Father between each decade. The blood brother of Dominic of Prussia was a member of the Order of Preachers, and inspired by his brother’s devotion, he introduced this rosary to his Dominican confreres. Soon this devotion that grew up in the silence of the cloister was preached far and wide in and outside of Dominican houses all over Europe. To keep all these thoughts before one’s mind required a booklet, and so the expression to “read the rosary”. 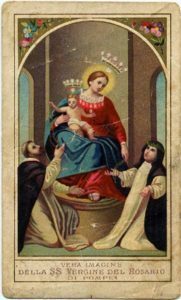 With the spread of printing and wood engraving, rosary booklets became common, but since it was too expensive to engrave and print 150 illustrations, the rosary was reduced to fifteen mysteries and fifteen pictures, one for each decade. With the passage of time, the rosary of 150 read mysteries tended to die out, but the fifteen-decade rosary endured, for the first mystery, the angel saluting Mary and announcing the coming of the Messiah. But then, since the meditative aspect of the rosary was felt to be slipping into the background, various narrative meditations were introduced before each decade to inform and concentrate the mind. One of the best known of the meditations was composed by the renowned Marian apostle St. Louis de Montfort around 1700. The rosary presented here draws on this historical background and the fresh initiatives of Pope John Paul II (Rosarium Virginis Marie, October 16, 2002), and proposes several helpful ways of praying it. The backbone or skeleton of the full rosary is now made up of twenty Our Fathers, two hundred Hail Marys, and twenty Glory Be to the Fathers. These vocal prayers are divided into twenty decades, and each one is composed of one Our Father, ten Hail Marys, and one Glory to the Father in honor of each mystery. The flesh and blood of the rosary is made up of the twenty events or mysteries of the life of our Lord and our Lady that we meditate upon while reciting the vocal prayers. The soul of the rosary is the Holy Spirit, who inspired the founder of this remarkable devotion and who inspires and assists each believing Christian who prays it devoutly and frequently. At the advice of Pope John Paul II, those who say five decades a day will usually pray the five Joyful Mysteries on Monday and Saturday, the five Luminous Mysteries on Thursday, the five Sorrowful Mysteries on Tuesday and Friday, and the five Glorious Mysteries on Wednesday and Sunday. In adding the five Mysteries of Light (Luminous Mysteries) to the traditional three sets, the pope has also recommended a period of meditative silence after the announcement of each mystery and suitable collect prayer at the end of each decade. He also suggests the use of icons to focus attention on each mystery, a return to the purpose of the wood engravings of the sixteenth century. The first and most basic way to pray the rosary is to announce each of the twenty mysteries in turn and then to recite the vocal prayers of each decade slowly and carefully in honor of that mystery. The mind is focused in a general way on the mystery, but the concentration is more on each vocal prayer as it is said. A second way is to announce the mystery and then read one of the suggested Bible passages to inform and sustain the meditation. A period of Silence is recommended before beginning the vocal prayers, and an appropriate prayer is supplied for the end of each decade. One might also consider saying only one or two decades at a time and put more effort, at first, into meditating on the biblical event directly. This is a particularly helpful way for those without much familiarity with Holy Scripture; they would do well to take this second step as soon as they have mastered the mechanics of the first way. A third way is to set aside these longer passages of Scripture and use only one short quotation to help begin and center meditation; for example, for the first mystery: “The Word was made flesh, and dwelt among us” (John, 1:14). who was conceived at the message of an angel. ~ Holy Mary, Mather of God, … Amen. Such phrases are provided below, but experienced users of the rosary might like to select or compose their own. The use of such clauses is considered “a praiseworthy custom” by Pope John Paul II. A fifth way – for group prayer – is to announce the mystery and invite members of the group to take turns making a short meditation out loud before the group takes up the vocal prayers of each decade. A sixth way is to use the beads as a kind of counter and say over and over again the key words of the Hail Mary: Jesus or Mary; the longer form of the Jesus Prayer: “Lord Jesus Christ, Son of the living God, have mercy on me, a sinner”; or some favorite phrase from Scripture. Whatever the method, the main thing to remember is that the physical handling of the beads, the constant repetition of the familiar vocal prayers, and the inner sense of the life-giving mysteries are conducive to the deepest forms of Christian prayer. The rosary in one of the finest methods ever discovered to enshrine in prayer the central themes of the gospel. [Source: W.G. Storey, A prayer book of Catholic Devotions, Loyola Press – 2003].